Welcome to the Sebatron Audio Website ! We are happy to announce the release of a new product - The VMPQuadPlus. 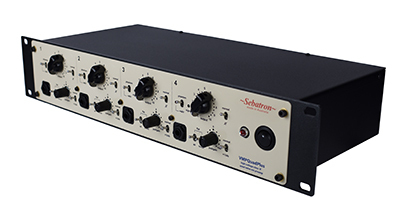 The VMPQuadPlus is a four channel valve microphone preamplifier built on the shoulders of the vmp-4000e. While both models share the most of the same biology the VMPQuadPlus has a few upgrades to build and circuitry that might suit the producer/engineer who desires more fine control over valve colour rather than EQ. Other differences include the addition of a front panel face plate over the switches for further protection from the elements and a few more db in extra gain. 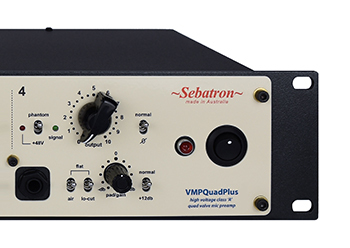 Both VMPQuadPlus and VMP-4000e (and all Sebatron preamps) exhibit a fast valve textural response that is void of muddiness or high frequency roll offs.Utilizing them for recording results in a wide, open and musical tone that does not contain any brittle or harsh peaks. Only the highest quality components are used and careful attention has been placed on circuit design, board layout and build to ensure high sonic performance, reliability and a long life. give the preamps a huge amount of headroom.